While it's true that many CPG companies enjoy solid balance sheets and profit margins, the industry is starting to see revenues and market values flatten. To compete effectively, CPG companies have to do something different. They need a new source of competitive advantage. One that allows them to bring new products to market faster and most cost effectively, get more out of promotions, assess and mitigate strategic and operational risks. 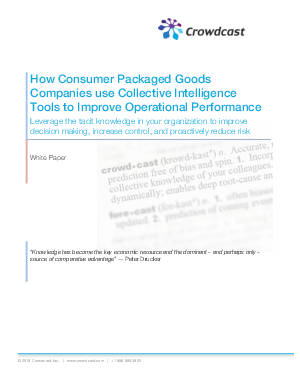 Find out how Crowdcast Collective Intelligence Platform helps companies align decision-making and understand and reduce risks associated with developing and launching new products and on-going operations.